High availability can be achieved in IBM mainframe environment utilizing parallel sysplex. Parallel sysplex is clustering technology which enables total capacity of multiple processors to be applied against common workloads as if they are part of a single computer (See IBM Z Connectivity Handbook). Although parallel sysplex implies additional hardware costs, adds another level of complexity to software environment and does not deliver additional end user facilities; more and more enterprises go for it. A well managed, properly configured parallel sysplex can decrease planned outages 90%, unplanned outages 10% and provide near continuous availability (See Share San Jose 2017 Parallel Sysplex: Achieving the Promise of High Availability Session 20697). Continuous operations and high availability are componenets of continuous availability. High availability masks unplanned outages from end users, continuous operations mask planned outages from end users. Continuous operations are achieved through non-disruptive hardware and software configuration change together with coexistence. High availability is achieved through fault tolerance, automated failure detection, recovery and reconfiguration. As a result continuous availability masks both types of outages from end users. This Article summarizes concepts of GRS in IBM zOS mainframe systems explaining how data sharing is performed in a multi-system environment. It also illustrates design specifications of related products. Finally operational aspects for different topologies are described. As data sharing is a vital issue in IBM system z mainframe environment, there is a separate component called GRS (Global Resource Serialization) for this purpose (1). In today’s multitasking and multiprocessing mainframe environments, users, transactions, tasks, programs, processes, jobs whatever units of work are, compete for accessing resources. A topology to coordinate the accesses is required, otherwise integrity exposure may occur. Before going deeper in these topologies, let me define “resource” first. Data sets (files for IBM system z mainframes), records of data sets, data base rows, data base fields, in-storage table entries, any object subject to update in multiuser, multiprocessing environment. You can make foreign exchange rates analogy at this point. Suppose that foreign exchange rates in a core banking application are kept in records of a data set. Most of the transactions “reads” the rate and proceeds. When an “update” is required, all read-only accesses should be stopped (delayed, postponed), update transaction is executed, read-only transactions should be allowed to “read” exchange rates again. Any design flaw will make foreign exchange transactions wait forever, time-out and/ or collapse or even worse, allow foreign exchange transactions from cheaper or more expensive rates. This is the easy part if you are in a single-system environment. Suppose there are more than one images of operating systems. There are transactions running in each systems accessing same resources. If no further precautions are implemented, this topology is called shared DASD (Direct Access Storage Device) environment. Disks are shared. When a system accesses a data set on a disk volume for update, whole disk volume is “reserved”. No other data set can be accesses from other systems. When update completed, disk volume is “released” and can be used by other systems (3). Until 1980s this implementation was okay and suitable for multi-system environment. As clustering activity soared among IBM mainframes to increase availability, this became insufficient. IBM mainframes were becoming members of clustered structures. This single-system image structures required data to be shared extensively. All members were connected with one-another using high-speed CTCA (Channel To Channel Adapter) links. IBM called this “ring” topology. When a resource to be accessed by one of systems, it is sending type and name of the resource to all other systems, all systems are putting this type/name couples in their own queue. This was called “ENQUEUing”. When a transaction or task finished with the resource, it was again sending type and name again to all other systems, they were removing resource from their own queue. That was called “DEQUEUing” (4). As you observe there are two deficiencies in this design. First resource name and type should be travelled to all systems before it is accessed by any system and resource related information should have been stored separately in all systems. These were time and storage consuming issues. Type of resource is named as QNAME (Queue name or Major name), name of resource is named as RNAME (Resource or Minor name). The message carrying both information is called RSA (Ring System Authority) message. Lists of resources defined are named RNLs (Resource Name Lists). IBM then took this cluster thing seriously and called it base “sysplex” inspiring from SYStems compLEX phrase. After this, IBM introduced devices named coupling facilities to store and transmit data much faster, integrated into sysplexes allowing members sharing data and named clusters “parallel sysplex”. Now it was possible for each member system to query resource information in CF (Coupling Facility) structures and send if not there. This topology was called “star” topology. Star topology did not have the deficiencies of ring topology. Sending data was fast, storing was not duplicated (5). In star topology enqueues are faster when compared with ring topology. But ring topology is only possible choice for non-parallel-sysplex zOS systems and recently used channels which we call FICON CTCAs are not supported. But all mainframe users did not implement parallel sysplexes. Data centers using shared DASD and/ or base sysplex without data sharing continued to use ring topology. In this eco-system MIM (Multi Image Manager) Data Sharing for zOS product of CA (Computer Associates) continued to be used. Customers liked DASDONLY ease of implementation of the product. It was not relying systems connected via CTCA. There was a shared data set accessible by all systems in the MIMPLEX (MIM comPLEX). Each system was accessing the shared data set in the fraction of a second, adding/ deleting its own resources (6). Let me get back to concepts of GRS which is under-the-hood engine for data sharing for zOS. Even if a third party data sharing product is being used, GRS is initialized at IPL (Initial Program Load) time and active at all times. GRS has its own storage management component and one large storage block is allocated during initialization. After starting GRS complex successfully, no operator intervention is required. If a contention or serialization problem occurs, either GRS or some other zOS component will detect it and notify operator. Since the systems in star complex must match the systems in parallel sysplex, operating is even simpler and more straightforward. Operators may display the status of systems in the GRS complex, change resource names and types dynamically, remove member systems if they restart them and notify other members from restart. Expectations from today’s business environment are high availability, continuous operation and quick disaster recovery. For these reasons, enterprises and partners try to increase their ability to respond to risks. Although it is more difficult, they also try to utilize opportunities. There are some items an enterprise should decide on. First of them is acceptable level of data loss. How much data loss is acceptable? A few seconds? A few minutes? Half an hour? Data entered before disaster and after last consistent backup will be lost. This period is called Recovery Point Objective (RPO). This data should be entered manually after recovery. This period should not be longer than some fraction of seconds for financial enterprises. Another period in disaster recovery timeline an enterprise will decide is how long it will take to start business after a disaster. This period is called Recovery Time Objective (RTO). If RTO is in minutes, it will cost a fortune. If RTO is some hours, cost will be less. Cost will be less and less if RTO is set longer. 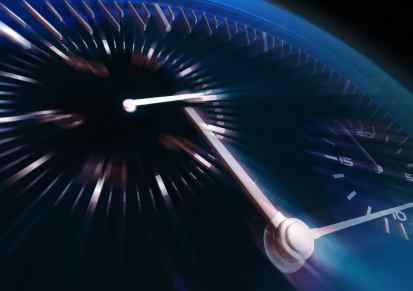 There are some periods of time related with disaster recovery. When an unexpected event or incident is occurred management of enterprise should decide whether this incident is a disaster or not. Since a capital goods investment is needed to recover disaster, approval of management is required. To decide whether an incident is disaster or not, management would need information related with damage. So a damage assessment is required and it takes some time. It also takes some time to start damage assessment after incident occurs. Finally it takes some time for disaster assessment after damage assessment. Sum of these time intervals is called Maximum Tolerable Period of Downtime (MTPOD) or Maximum Tolerable Outage (MTO). Beyond this point, enterprise is out of business. Lost market share, loss of share value, and loss of brand image; etc. Components causing outage in a disaster are servers, storage devices, network components, software and infrastructural components like power. 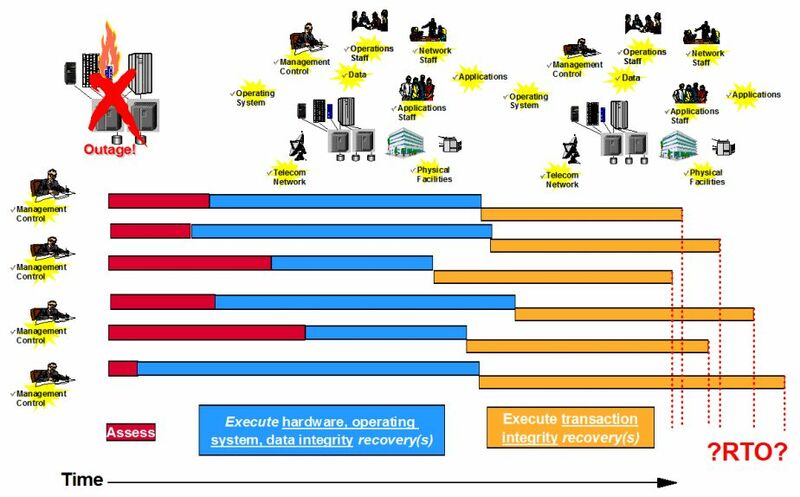 Recovery can be decomposed into hardware recovery, data integrity and data consistency. Hardware recovery is making hardware, operating systems and network connections available. All storage devices and network components should be up, operating systems should be running. Data integrity can be considered as part of hardware recovery or it can be considered as a separate item. This point is a bit confusing. Most of IT staff tend to claim that “Everything is up and running” but this is not the case. Data is not recovered from users’ standpoint. Application and data consistency should be attained. Applications should be recovered from most recent version backups. Data base resources should be restored from last image copy backups, log changes should be applied. A database restart should be performed. It is hoped that long and unpredictable database recovery will not take place. Just a few incomplete logical unit of works (luws) may be rolled back. After these activities, transaction integrity will be okay. Recovery Consistency Objective (RCO) is another concept related with business continuity. It focuses on data consistency achieved after disaster recovery. 100% RCO denotes all transaction entities are consistent after disaster recovery, any target below this amount means that the enterprise tolerates some data inconsistencies. Single most critical factor affecting successful disaster recovery is avoiding labor intensive and unpredictable duration application and data base recovery. They should be fast, repeatable and consistent. 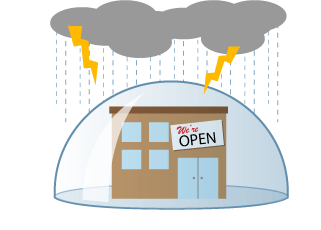 Rolling disasters should be another consideration in successful business continuity. Disasters may spread out over time. Partial damages may not be recognized on time, as time passes, they cause problems but it may be too late. Databases for example restarted but long recovery takes place due to inconsistencies and further loss of data recurs. Some enterprises have heterogeneous platforms. If this is the case, there would be duplicate work for all platforms. Additionally assessments, hardware recovery and transaction recovery times are different for all platforms. This situation could be very difficult to coordinate and very complex to manage. After disaster recovery planning is completed, it is implemented. Implementation involves setting policies, material acquisition, staffing and testing. Periodical tests should include swinging from primary site to secondary site and vice versa. After completing implementation, periodical maintenance takes place and frequent testing should accompany maintenance for successful disaster recovery. zSecure is a suite of security products to improve management of System z security environment. zSecure Admin and zSecure Visual components are the ones I installed and reconfigured recently. zSecure Admin lets security administrator perform more productive and zSecure Visual allows to perform these in MS Windows workstations. Installation is pretty straightforward. There are SMP/E datasets, target libraries, distribution libraries and configuration datasets. After APF (Authorized Program Facility), TSO (Time Sharing Option) command authorization and PARMLIB enablement it is ready to use. To start using execute CKR command list in SCKRSAMP library. It would be useful to add it as an option in ISPF/PDF (Interactive System Productivity Facility/ Program Development Facility) system administration panels. One of very useful facilities of zSecure is it has a set of profiles to allow regular users to perform security administration. You can authorize a regular user just to create users and reset passwords. This is very useful for service desk applications. There is no need to give high grade system-special or group-special authorities to service operation staff. Another useful facility is Collect function. It allows to collect and keep status of all data sets (Freeze data set) together with RACF (Resource Access Control Facility) database periodically. Daily, weekly or monthly information lets auditors to observe access information in the past practically. zSecure Visual is not a long running task like other zOS address spaces. It is started by a started task but, works as a set of OMVS (Open MVS) USS (Unix System Services) processes. After some time “Accepting Logons” message is issued and Visual is operational. zSecure Visual behaves like other zOS subsystems in parallel sysplex (Systems Complex) environment. To access Visual, it is necessary to access the TCP/IP environment of the sysplex member Visual is started. zSecure Visual server is generally started when system started through automation and up all the time. Default port Visual server uses is 8000. Client user should be identified by server before usage. Client user logs on zSecure Admin first using a TN3270 terminal. A token is created by server on 3270 terminal. This token is pasted in client logon panel and saved in client. After this process client can use Visual server. Authorities issued in System z environment tend to grow in time. After some time some of authorities are never used and become garbage. But it is very difficult to differentiate accessed and not accessed authorizations. traditional SMF (System Management Facility) records data is huge and very difficult to manage for this reason. zSecure supplies Access Monitor facility to address this problem. Access monitor is executed in all members of sysplex and all accesses are captured in datasets. Those datasets are consolidated daily, weekly, monthly and even yearly. So they do not take much space. Least used authorizations are authorizations related with yearly applications. After two years of monitoring, it would be safe to remove never accessed authorizations and resources related with them. Final facility I will tell is CARLA language embedded in the product. Most of the functions are implemented using this language and it is very easy to customize zSecure using CARLA language.